This year, FEVE – the European Container Glass Federation celebrates its 40th anniversary. We can look proudly on our past achievements to build the future with confidence. The container glass industry remains a modern and innovative industry producing environmentally-sound packaging. Living sustainably is not just about saving the planet; it’s also about looking after your health. Choosing glass is one way to do both. Lost in transition: is the circular economy a multi-material strategy? Glass was discovered accidentally by Phoenician merchants shipwrecked off a sandy coast. They used lumps of natron, a naturally-occurring material, from their ship to support their cooking-pots. When these came in contact with the sand, the merchants were surprised to see that it created molten glass. Egyptian glass beads are the earliest known made glass objects. Glass blowing was first developed by the glassmakers of Syria. They discovered that molten glass could be blown into different unique shapes which made glass production easier. Other regions quickly adapted this revolutionary technique for unique purposes, such as creating glass vessels for beverages, oils and medicines. Glass making became very popular during the Roman Empire as glass became more available and spread throughout the region. Ancient Romans used glass bottles to store their wine, oils and many other products. 325-350 AD -The oldest wine bottle in the world! Archaeologists later discovered this ancient wine bottle in Speyer in Germany – with wine still in it. After the fall of Rome, there is evidence that glass making continued to expand and new glassmaking technologies developed. Glass manufacturers in North West and Central Europe started producing ‘forest glass’ by using wood ash and sand as the main raw materials. Forest glass is known to have had a distinct green colour. In the late middle ages, glass makers in Germany, Switzerland and Italy also created clear glass containers. Glass makers on the island of Murano revitalised the glass industry in Italy. Murano craftsmen perfected the art of making the purest clear glass (known as Cristallo) using manganese oxide. By the 16th century, Venetian glass makers had gained greater mastery in making coloured glass. Murano is still a major decorative glass centre today. 1568 - first bottled beer! A Parish priest in England accidentally invented bottled beer. An English businessman discovered how to make lead glass on a large scale. This new glass was softer and easier to decorate, and it proved invaluable to the optical industry. Optical lenses, astronomical telescopes and microscopes became possible. 1772 - The soft drinks industry was born! Scientist Joseph Priestley used a glass bottle to discover oxygen. He made an immense contribution to the glass industry as his discovery revealed a practical method of carbonating mineral water. John Landis Mason invented a glass jar with a threaded finish. To seal it, you had to screw on a lid. The ‘Mason Jar’ made it easy to store and preserve food longer. Glass making developed from traditional mouth blowing to a semi-automatic process thanks to the invention of Howard Ashley and Josiah Arnall in England. An American engineer Michael Owens invented the first fully automated glass making machine. It was so efficient, it could do the work of up to 54 skilled workers and made 2,500 bottles per hour. The US company Hartford Fairmont introduces a new system of mass producing bottles called ‘The GOB feeder’. This system made perfectly shaped GOBs by controlling the temperature of the glass. To make glass production even more efficient, Henry Ingle of the Hartford Empire Company invented the individual section (IS) machine. This featured a bank of molten glass and blow molds in a row. The GOBs fed into each mould, one after another. Today, the vast majority of glass containers are produced by individual section machines. A double GOB manufacturing system is invented. This system allows the production of multiple containers simultaneously in one mould. Heye of Germany invented the narrow neck press and blow (NNBP) process to gain better control over the distribution of glass in the finished product and save the amount of molten glass used in production. The innovation led to a significant reduction of weight of glass bottles. The first bottle banks appear in Europe. Glass is the first packaging material in Europe to use bottle banks for recycling. The Vertiflow system massively improves production speed and quality. The system uses software to direct the internal mould cooling to achieve a constant mould temperature. Other developments followed rapidly, with the industry advancing technology to improve glass production, quality and design. In the last 40 years, the industry has continued to reduce its energy consumption by 80% thanks to increased recycling, more efficient manufacturing and innovative technology. 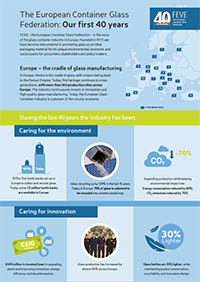 Today, 74% of Europe’s glass is recycled in an authentic and well-functioning Circular Economy. The industry employs more than 40,000 people and holds more than 162 manufacturing plants across Europe. It supports 125,000 direct and indirect jobs in Europe.